A little break from our North Eastern adventures, as Phil and I went off to Shrewsbury to a model show Phil wanted to attend, and we took an extra day there for me to wander around Shrewsbury and take some photos of course. Shrewsbury is a market town, on the River Severn, 9 miles from the border with Wales.It has a largely unspoilt medieval street plan and over 660 listed buildings, including several examples of timber framing from the 15th and 16th centuries, so I knew it would be a fab place to photograph. Originally the capital of The Kingdom of Powys in the early middle ages, it has been the site of many conflicts between the English and Welsh, with The Angles, under King Offa of Mercia taking possession in 778. William the Conqueror held off the Welsh hordes who besieged the town in 1069 and 5 years later William gave the town as a gift to Roger de Montgomery who built the castle in Shrewsbury. Between 1135 and 1153 a civil war raged in England and Normandy, known as The Anarchy, by which time Empress Maud, who wanted to rule England, had installed her own man in the castle at Shrewsbury, William FitzAlan, a nobleman of Breton ancestry. He was a major landowner, a Marcher lord with large holdings in Shropshire, where he was the Lord of Oswestry, as well as in Norfolk and Sussex. However, King Stephen put paid to that as he had already claimed the throne and successfully besieged the castle during the war. It was in the late Middle Ages (14th and 15th centuries) when the town was at its height of commercial importance. This success was mainly due to wool production, a major industry at the time, and the wool trade with the rest of Britain and Europe, with the River Severn and Watling Street acting as trading routes. In the spring of 1349, The Black Death plague arrived and took a high toll on the population of Shrewsbury. Records suggest it was devastating. Examining the number of local church benefices falling vacant due to death, 1349 alone saw twice the vacancies as the previous ten years combined, suggesting a high death toll in Shrewsbury. In 1403 the Battle of Shrewsbury was fought a few miles north of the town centre, at Battlefield; it was fought between King Henry IV and Henry Hotspur Percy, with the King emerging victorious, an event celebrated in William Shakespeare’s Henry IV, Part 1, Act 5. Well, that will do for historical bits, though of course, the town’s history is much more extensive. 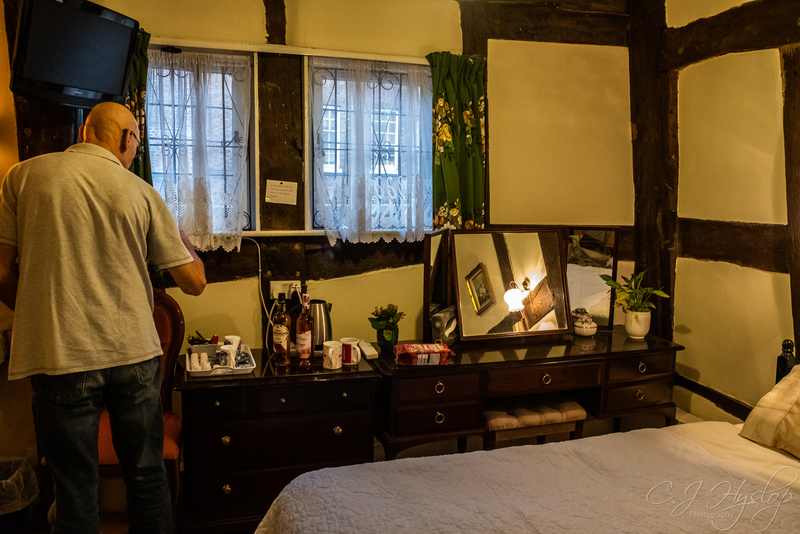 We stayed in College Hill Guest House just outside the town centre, it’s a 16th-century dwelling. Everything was higgledy-piggledy, the floors creaked with every step, the stairs and walls leaned, but you could feel the history. So let’s have a wander around. 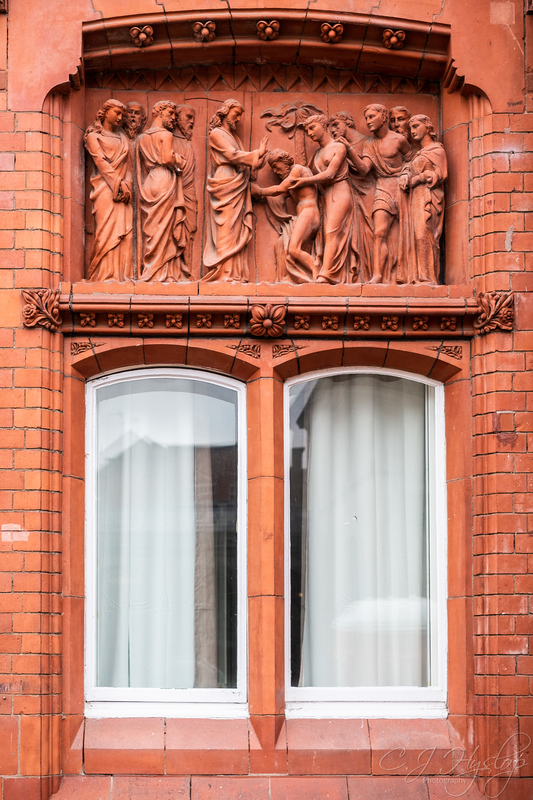 An Eye, ear and throat hospital opened in 1881, now converted into flats. The next interesting edifice we came across was just around the corner. 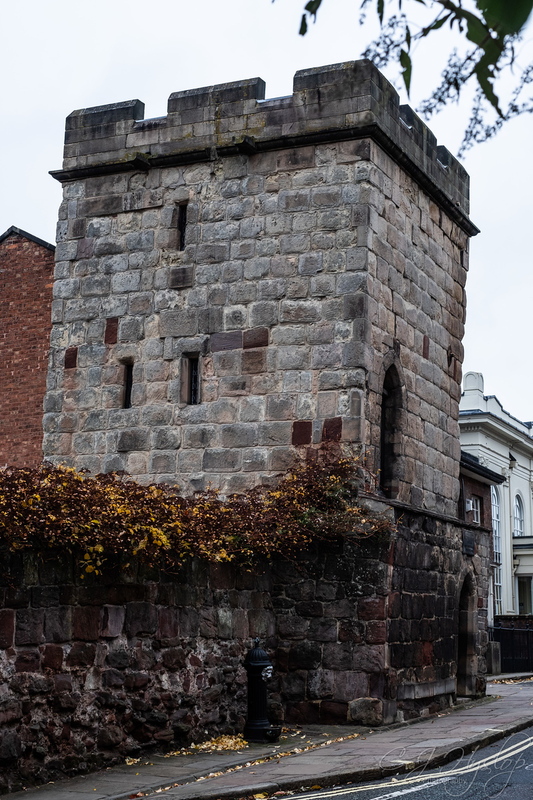 Town Walls Tower is evidence of Shrewsbury’s history as a strategically important settlement close to the border with Wales. It formed a key part of the defensive walls that once surrounded the town and is now the last surviving example of those defences. The building of Shrewsbury’s perimeter walls is dated to 1220 and 1242. Henry III issued a royal mandate urging the men of Salop to fortify the town, and grants for building walls were made during his reign. The king visited Shrewsbury on several occasions, pursuing his campaign against the Welsh. By the 14th century, the walls had fallen derelict, and Henry IV commissioned further rebuilding. Town Walls Tower was probably added during this time when the town was at risk from attack. A map of 1575 shows the town almost fully encircled by walls featuring several similar towers. They were a means to observe land around the town and river. All gone now except this one. 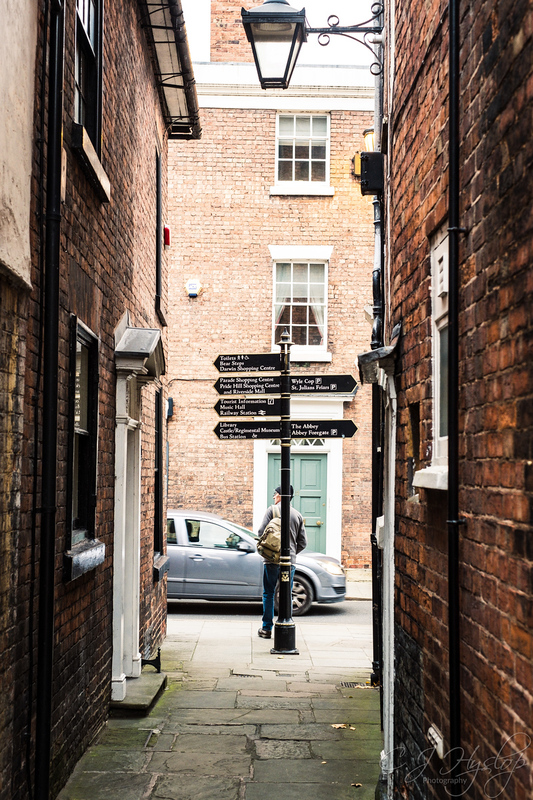 But today we’re going to walk through the alleyways of Shrewsbury. 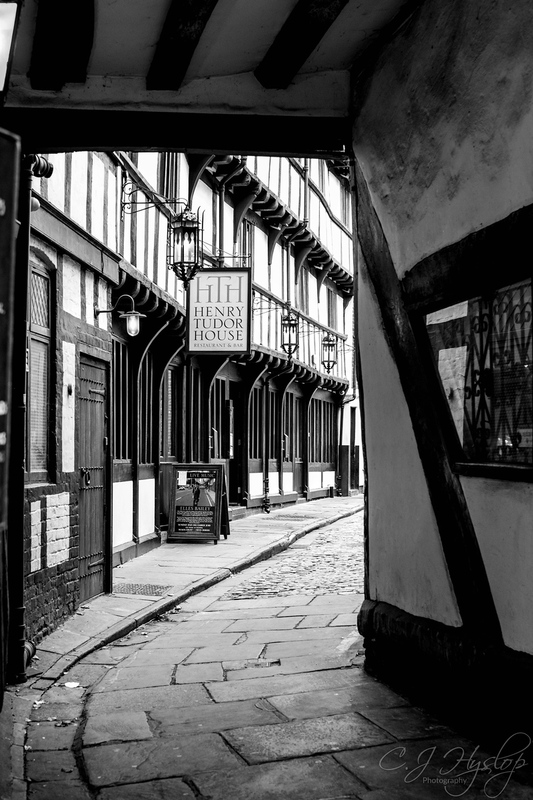 Henry Tudor House is a restaurant and bar located in one of the most historic half-timbered buildings in Shrewsbury, believed to be the place where a beleaguered Henry Tudor sought refuge on his way to the Battle of Bosworth in 1485. The Golden Cross is reputed to be the oldest licensed public house in Shrewsbury and records show that it was used as an inn as far back as 1428, some years before the introduction of formal licensing. Stay tooned and we’ll visit some more medieval buildings next time. 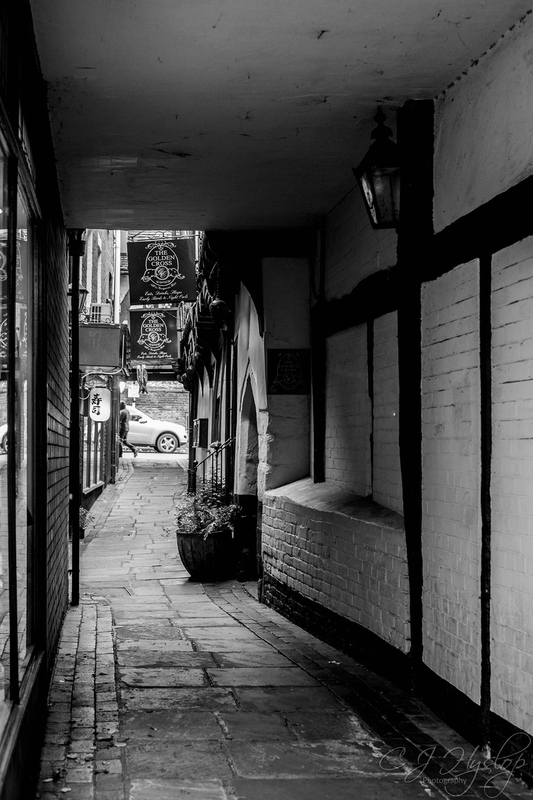 Posted in Adventures, Anglo~Saxon, architecture, B&W, Fuji, FujiX-T2, History, medieval, photography, UncategorizedTagged adventure, architecture, fraggle, FujiX-T2, history, landscape, medieval building, November 2019, photography, Shrewsbury, UKBookmark the permalink. What an interesting post. Love the streets and the black and white shots. I’ve always wanted to go to Wales. How long did it take you to drive (I assume) from your east coast location to Wales? About 4 or 5 hours, with a couple of stops for refreshments. Cheers Cindy. Lovely, Fraggle; my kind of town. As you say, packed full of interesting buildings and stories. Years since I was there; once had a meeting there with the local authority who, as I recall, couldn’t organise the proverbial ****-up in a brewery, but who occupied some wonderful old places. A fan of M&S biscuits, by any chance? What a great series. Here, I’ve heard of Shrewsbury. Isn’t it also the site of the Brother Cadfael stories? 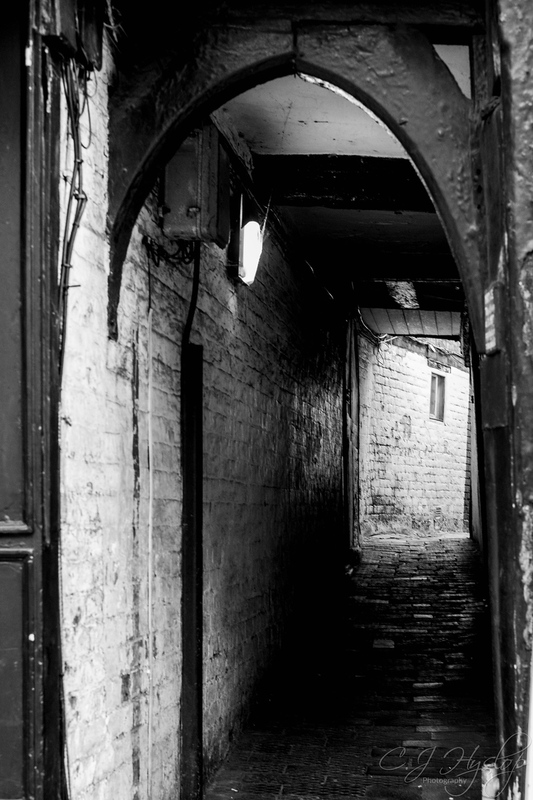 Anyway, both color and B&W are great shots, and I really like the alleys. What a lucky gal you are to live with such history! Yes Brother Cadfael is set there, am going to have to read them! The Brother Cadfael mysteries are quite good. The stories mention Queen Maud and King (?) Stephen – when you mentioned Maud is when it all clicked – Shrewsbury was the harbinger. Can you imagine being a detective in the 1100-1200s?!! I can’t imagine being anything in those times – I can’t live without a hairdryer!!! Ohh Fraggy you hit gold. My kinda place, I’m loving looking aT these photos. Fantastic tour woman!!!!!! Loads more to come, wish I’d had longer than a day there, so much I missed! Cheers MB, I sometimes think plague was Mother Natures way of keeping the general population in the right numbers for the earths resources. In which case we are probably due for another one!! Yes I would agree with that. I’ve been to Shrewsbury often, but mainly to shop. It’s obviously worth a wander as well. Hey, ME TOO!! I should have said geek, because nerd actually denotes unattractive. Geek is way better… Unless it’s those chaps who bite the heads of chickens… Not to fond of them. Lol!! There’s geeks biting off chicken heads?? The term “geek” in the 19th century was used for those in traveling circuses and carnavals. They were the sideshow freaks. Lol! Well that makes sense 🤣🤣 will let OH know I was right all along immediately! When my daughter was about 4 years old we had a week in Shrewsbury. We stayed in a lovely old house right in the centre of the town. I recall we had a beautiful holiday. I only have a couple of photographs unfortunately. Your stay looks fab. Great images as always. 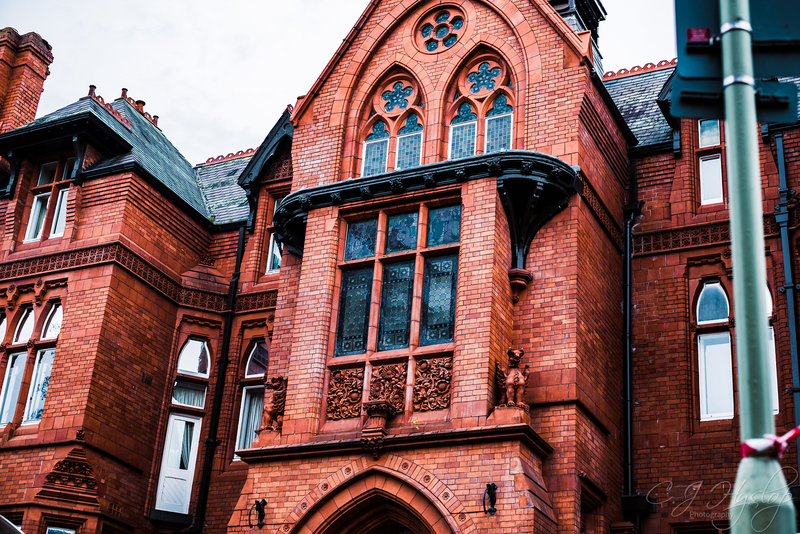 Fraggle, there is so much to love in this post — the guest house, and that red brick building really is magnificent. 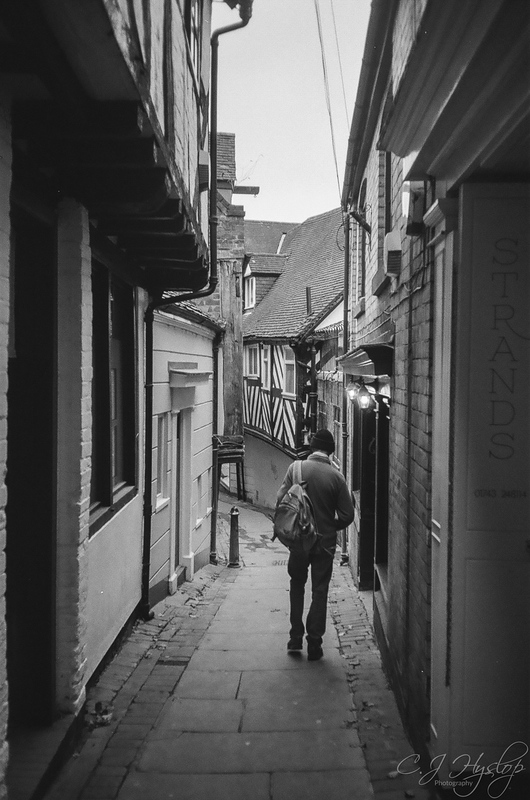 Those tiny streets… I’ve always done a mental stumble, as many times as I’ve seen photos of them. They make everything seem so close, closing in. I’ve never been claustrophobic, but the idea is rather unnerving. Maybe it’s just that you had my imagination in high gear. 😀 Hugs on the wing. PS Nice potted history. We actually lived on Percy Street!! Ah that’s cool! WIll check out the link thanks! 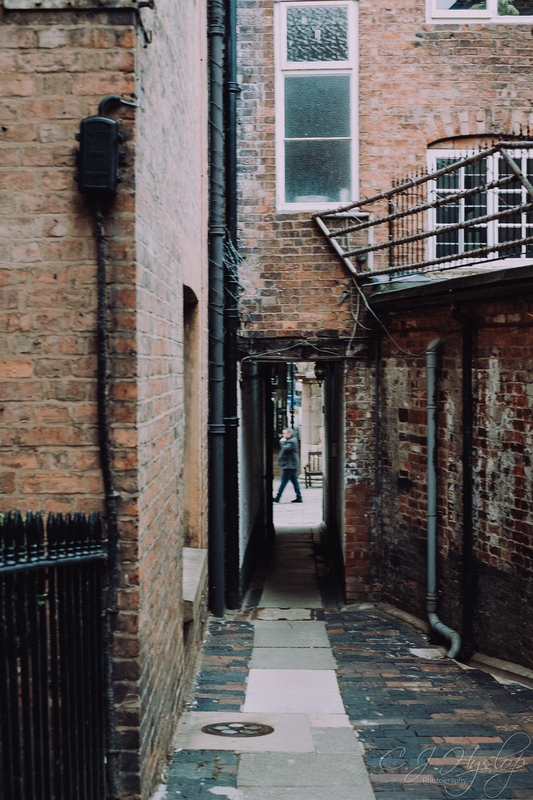 I think it is equally nice to simply wander through a place although I do sometimes find afterwards that I missed something important which can be annoying. Excellent photos Fragg…. Of course your discussion is so personally descriptive, but your photos tell such a story. Ahhh….no on to part 2. Great shots. 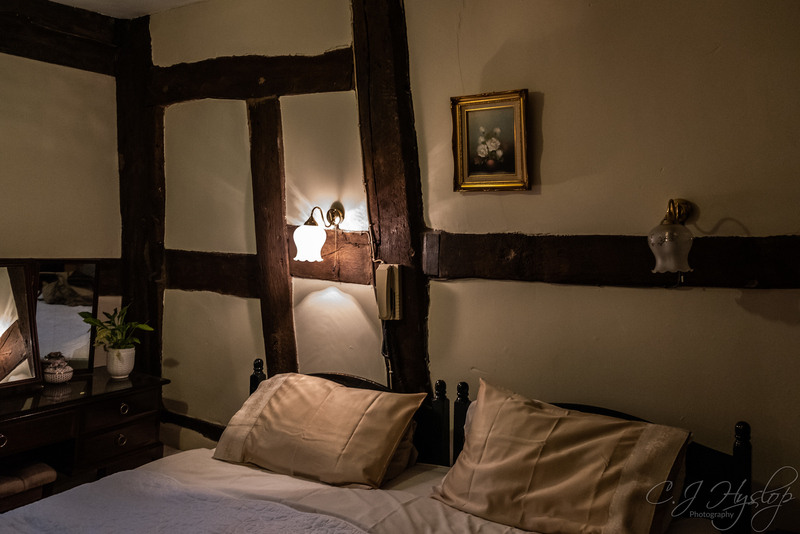 We spent a single night in Shrewsbury on our way to Wales. 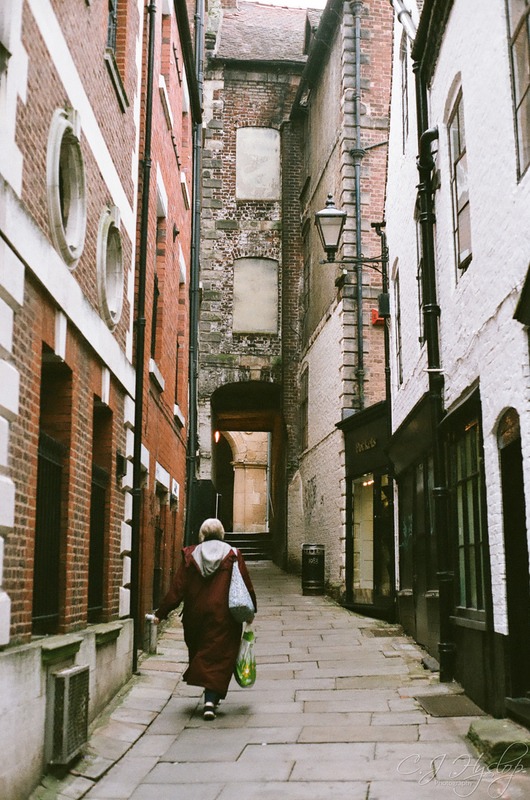 It does have a nice ye olde England feel to it — I’d love to go back and explore it properly. Well worth a couple of days, hope to go back myself as there’s so much there.